The movies' love of boxing knows no end. What is it about palookas that is so inherently dramatic? Sure, there's built-in physical conflict, but I'd guess that most boxers don't take their fights personally. They're two guys paid to punch each other. We have to look in on a fighter's personal life to glean any sort of message beyond how to take a beating in the ring. 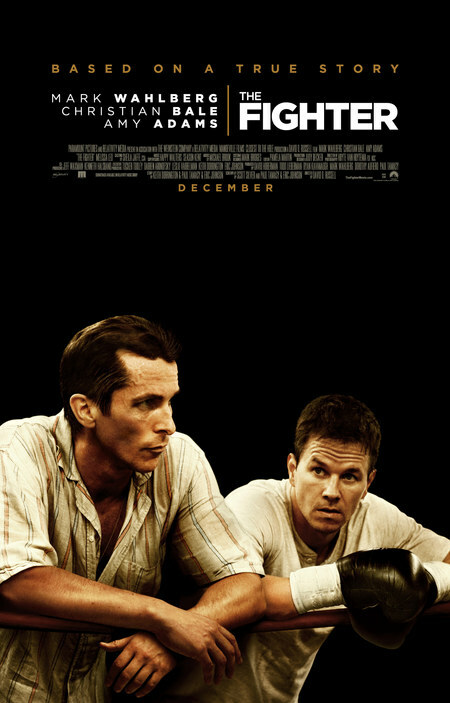 In The Fighter, we have a take on the boxing genre that tries its best to focus on the struggles of the man wearing the gloves, but instead comes up with slightly modernized version of the sports hagiographies of yore. It might as well be called The Micky Ward Story. "Irish" Micky Ward (Mark Wahlberg) is introduced as a once-promising welterweight who badly needs some victories to get his career back on track. Aiding and obstructing him are his half-brother/trainer Dicky Eklund (Christian Bale) - who once fought Sugar Ray Leonard before succumbing to crack addiction and petty crime - and his holy terror of a mother/manager, Alice Ward (Melissa Leo), the hideously-coiffed hive mind of a sprawling, brawling brood of Massholes. Wahlberg finally starts to turn things around without the help of the family concern, but he's forced to assert himself and clean up the messes of his relations when they have trouble keeping it together without him. He's strangely passive, and Wahlberg has trouble playing Ward as anything more than a workhorse gym rat who's mildly annoyed by his family's shenanigans. The performances pick up the slack when the story becomes rote. Bale is great as the film's tragic figure, and Leo plays master puppeteer to the hilt, balancing maternal concern, fury, and guilt-tripping. Amy Adams has a turn as the woman whose love saves Wahlberg, but it isn't clear to me how she is different from the other meddlesome influences in his life who more or less assume his sainthood. In real life Micky Ward is best known for his classically brutal 3-match series with Arturo Gatti almost 10 years ago; I'm already well aware of his superhuman ability to absorb punishment and his overwhelming desire to win. Most of what The Fighter tells me is that he's a darn nice guy too for putting up with his nutty relatives. Perhaps the movie could have spent more time with them.